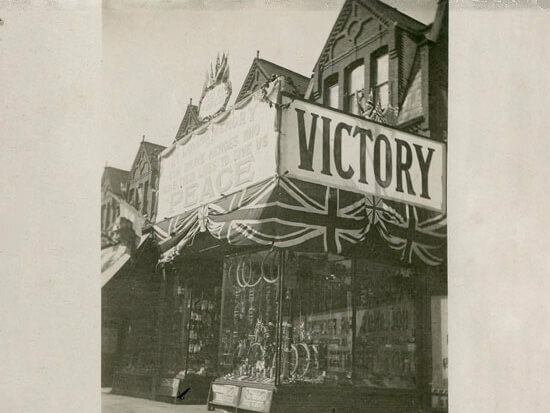 The news that an armistice had been signed and hostilities with Germany would cease at 11 o’clock took Hornsey by surprise on Monday morning. Some delay in the announcement was expected owing to events in Germany and the early intimation of the glad tidings, transmitted mainly by telephone, was received with some credulity. The news seemed too good to be true. Is the Great War really over? When at 11o’clock maroons were discharged at the police station and the sirens were sounded there were doubts whether the voices intimated peace or war, and some people prepared to take cover in case the worst happened. But when the bugles sounded the “All Clear” and a distant heavy gun gave a Royal salute all doubts were set aside, and everyone knew that the war was over. In many cases the church doors were opened, and congregations gave thanks to God for a great deliverance. Smiles appeared on the faces of everybody who was out and about. As if by magic flags and bunting appeared from house and shop and public building, and streamers were hung across the roads. The omnibuses were decorated with patriotic devices, and every trolley-arm on the tram-cars bore a flag. Tricolour favours were worn by men, women, and children, and even baby hands waved the Union Jack. The shopkeepers who sold flags and fireworks had a busy time, and at some periods queues were formed. Lessons ceased at the schools and the children did not return to them that day. A number of business firms also put up the shutters or shortened the working hours of their assistants. The streets were bright through the removal of the lighting restrictions. Fairy lamps and Chinese lanterns adorned many casements, and small boys discharged fireworks with impunity in the streets, while there were many private displays with an abundance of coloured fire, in many suburban gardens. Those forbidden luxuries, bonfires, were also indulged in. Here were few demonstrations in the streets. Perhaps the drizzling rain was not conducive to too much exuberance out of doors, or the more enthusiastic inhabitants had gone to join in the revels of London Town. Places of amusement – the music hall and the picture houses – were crowded, and enthusiastic scenes occurred on the slightest prompting. The main streets were thronged on the following night, and bands of young people walked to and fro singing patriotic airs and popular songs. There was a large crowd around the Clock Tower, Crouch End, where a fiddler kept things merry with his lively music. There were also hundreds of promenaders at the bottom of Stroud Green Road, and several tin-whistle bands paraded the High-street, Hornsey. There were similar scenes on the two following nights. No fires or accidents occurred on either night, and no charges arose at the Police-court. This afternoon the King and Queen, accompanied by Princess Mary, will drive through North London, the route including Junction Road and Holloway Road.